So today I will be featuring a photograph from Bancroft Castle in Groton, Massachusetts. I find this photo perfect as it is a beautiful and unique spot, and shows Shadow and Wilma’s excitement in the moment. Why pose when you can roll around and play?! I found it adorable, and thought it was the perfect choice for today’s Weekly Video/Photo. See the “Massachusetts” section of my blog for more on our Adventure to Bancroft Castle. Yesterday Shadow, Wilma, My Mom, and I Adventured to Nobska Beach in Woods Hole, Massachusetts. Nobska Beach is a small, white-sanded, narrow beach that offers views of Martha’s Vineyard and the Nobska Lighthouse. We had a therapeutic Adventure to the Nobska Beach, probably my favorite stop of the day. Peaceful and quiet we found the beach almost exclusively to ourselves. Shadow hustled to the water and immediately waded in for a dip. I decided to take my sneakers off so Wilma could explore a bit more, but found the water quite frigid, something you would never guess by watching the water loving Shadow continually in the water. The ocean was a lovely color, clear in some areas allowing the spectacular view of seaweed flowing under water. There were rocks along the shore for some Wilma jumps and posing, along with a view of the Nobska Lightouse in the distance. Shadow and Wilma enjoyed some playing and digging, while Shadow was quick to roll around in the sand. This beach was simple but yet gorgeous, and calm. So glad my Mom could join us in this relaxing oasis. We definitely will be back (Rating: 4). 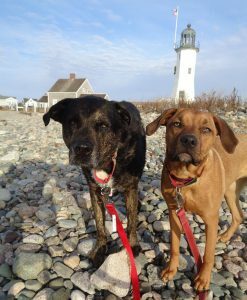 Yesterday Shadow, Wilma, My Mom and I Adventured to the Nobska Lighthouse in Woods Hole, Massachusetts. This was our second trip to this Lighthouse as Shadow, My Mom and I had visited back in April 2017. The Nobska Lighthouse is located on the Southwestern tip of Cape Cod. It was established in 1826 but later rebuilt in 1876. The lighthouse tower is 42 feet in height, and is made of cast iron with brick lining. We had a scenic Adventure to the Nobska Point Lighthouse on a gorgeous spring day. It was one of the first warm days of the season, causing us to take a little trip down to Cape Cod. Upon arrival were pleased to find parking, a feat that can be difficult during the summer months. We took some photographs and wandered around taking in the beautiful structure. Lovely views of the ocean and the sounds of the shore filled our senses. We decided to find a spot to sit and lounge, as my Mom, quite an amazing artist, captured the beautiful location in sketches. It was nice to relax in the sun, although a bit of a challenging experience for our little Wilma, always on the go! However Wilma did well and found some sticks to chew as we enjoyed some coastal therapy. Shadow seemed to enjoy the sun and checking out the view of the shore. Both pups had a moment of unease as the drone was launched, but recovered quickly and carried on. After finishing at the Lighthouse we crossed the street to check out the view and snap some more photographs. The walk down to the rocks was a little steep so we decided to not venture down to the shore, but of course enjoyed some more photographs before heading back to the car. A memorable Adventure to the Nobska Lighthouse with perfect company (Rating: 4).